Faced by counselling theory which demands moral neutrality and respect for the autonomy of the client pastoral theologians have argued for greater ethical reflection and challenge in the counselling relationship. But how far is it possible for pastoral counsellors to genuinely respect the counsellee and also challenge her moral meaning? It is the argument of this book that the balance between autonomy and ethics has not been successfully struck. Theologians have paid lip service to the freedom of the counsellee whilst at the same time asserting a priori values. Robinson argues that the balance can only be effectively achieved in and through agape and the related empathy. Properly understood agape provides both the environment of care, and also the core moral meaning which is central to change and healing. Agape provides the relational environment in which the counsellee learns to frame her own narrative. It is a way of being, knowing and empowering which enables the counsellee to develop autonomy in community. As such it is firmly based in spirituality. Agape also informs moral meaning at a cognitive as well as affective level through an ethic of unconditional and forgiving love embodied in the counselling relationship. This enables the counsellee to move from a narrative based in conditional worth and shame to one of worth based on the care of others as well as the contribution she can make to the community. Agape in this provides the key criteria for testing all moral narratives, including the counsellee’s and the churches. Far from being a threat it can strengthen both and provides a focus of continuity and trust for dialogue in post modern ethics and care. 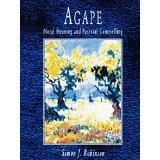 Robinson shows how that dialogue is played out in the counselling relationship itself, and in so doing challenges both secular counselling theory and much of modern Christian ethics. This timely book written by an experienced practitioner offers the reader and all too rare combination of theological scholarship and informed pastoral insight. Its comprehensive blend of theory, both theological and ethical, and of reflexive praxis will make this book a valuable tool for practitioners, teachers and students alike. At a time when pastoral care is under scrutiny both inside and outside the Church Dr. Robinson offers a rigorous defence of Christian identity and practice which is nonetheless, characteristically, open and dialogical. A superb resource which deserves to find its place in the libraries of both academic departments and training institution as well as on the desks of all those who take seriously the call to informed professional practice. Simon Robinson has undertaken a project which is long overdue. He has unpicked and reconstituted the strong but delicate relationship which inevitably exists between ethical reflection and counselling in a pastoral context. Both the ethical issues which come up in counselling and the issues which are integral to the counselling relationship itself are explored with theological sophistication.